My Srilankan Airlines FlySmiles rewards redemption story! After spending over 1.1 lakh rupees (INR) with Srilankan Airlines over 2 years, I could finally redeem my FlySmiles points into a gift. If you are wondering what that gift was, here it is- a kids watch, worth roughly INR 100-200 (USD 1.5-3). 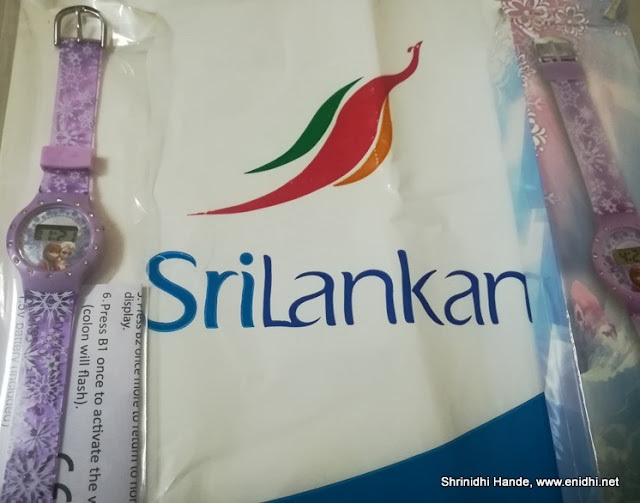 This post explains my travels with Srilankan and how their FlySmiles point scheme works. Though I do undertake reasonable travel, I am not too much loyal to any one airline- I fly whenever it is cheap, to wherever it is cheap and on whichever airline it is cheap. But in recent times, Air Asia and Srilankan are two airlines on which I had maximum flights. AirAsia Big Loyalty program is useless for me since they don't give any points on promo fares and even a Platinum level member doesn't qualify for any facility like lounge or priority boarding etc. So Srilankan is the only other airline on which I had accumulated some loyalty points that were high enough to redeem something. In past 2.5 years, below are the various flights I have booked and flown on Srilankan and the ticket money spent. To be fair, of the above 1.12 lakh rupees (INR) spend, only half of it was on myself, rest were on paid by me but for my family members. Srilankan (and many airlines) give loyalty points only to passenger who have the loyalty program account in their names, not for other passengers booked by loyalty program member. It was my decision to fly all of them on Srilankan, I made the booking and paid for their ticket, I was also one of the passengers in the PNR so naturally I felt I qualified for some points for this. But doesn't work like that with most airlines. If I had created an account for each of the guests they also would have got the points for their flights, but that would have been a total waste of time and effort as they don’t fly enough to accumulate redeem worthy points in time and those points would eventually expire. Plus each one of them will have to endure endless marketing emails from Srilankan. Air Arabia has a provision to transfer points to head of family- such a provision would have been nice if other airlines also allow it. How much FlySmiles loyalty points do we get on Srilankan?- it is a function of sector flown (how long is the flight), fare type and class (promo, flexi etc, economy/business) and other factors. For a Chennai-Colombo economy flight I got about 125 points one way, whereas Colombo-Beijing sector I got about 1600 points one way. Of the 55000 odd rupees I spent on my own flights with Srilankan (14 flights), below is how the point earning went. My first ever trip with Srilankan was to Male, Maldives in October 2016. I promptly got some 1000 odd points for this trip, but they promptly expired in Feb 2018. There was nothing I would do to redeem them in anyway. Srilankan has a set of playing cards costing 723 points, but that couldn’t be redeemed because of two reason- one- only points above 2000 will be considered for redemption- to redeem something worth 732 points, I should have 2732 points minimum and second, the redemption is handed over on board a flight- unless I am flying on Srilankan before points expiry, I can’t get any gifts. So with initial points gone, I had 3 more trips with Srilankan this year-to Colombo, to Gan Island and to Beijing. From these trips I got some 4500+ points (points for Beijing-Chennai sector pending to be credited)- So now I had some 2500 odd points that could be redeemed for something. Using miles to upgrade was one option- but upgrade costs 7500 points for short flights like Chennai-Colombo, more for other sectors. Holiday I wasn't interested in, so redeeming into a gift that will be given to me on my next flight is the only thing that could be done. One was the kids watch, that needed some 2400 points and the other was Srilankan Air taxi playing card that costs 723 points. Srilankan values the 723 point playing cards at USD 5, but I know card is available for under INR 100. Similarly the 2400 point kids watch probably has an inflated list value of 10-15 USD but we all know such watches can be bought for a hundred rupees or so. When I tried ordering the playing cards before my China trip, I was few points short- so I had to wait till I get to Beijing, wait for Chennai-Beijing points to be credited and then order- after the first leg I got some 2500+ points, just enough to order the kids watch. Couldn't wait for return trip because then I could redeem only on next flight, which I don't know when. Without much options left, I ordered the kids watch, to be delivered to me on my Colombo-Chennai flight..
During my flight, I expected them to come to me and offer the gift- there was no sign of it- so I had to press the call button, show my receipt and remind them- after two reminders, when we were about to land, I finally got the gift. Overall didn't like the experience. It was too much effort for a reward of too little value. Of course, I am not a frequent flyer with Srilankan and don't expect a lot- I am happy if they can take me to my destinations on time- anything else is a bonus, but had to write this post because using loyalty points isn't all that glory when you don't fly a lot with the airline. I now have another 1800 points credited for Beijing-Chennai sector, after completing my journey- to redeem this I will have to take another flight within an year or two- I don't know when my next flight with Srilankan will be- depends on the next deep discount sale they run. Let me see how it goes. Note: Intention of this post is not to criticize Srilankan airlines or FlySmiles program. This post is only to share my experience with the program. Depending on your travel lifestyle, the outcome could be totally different. I also understand that 1.1 lakh INR is not a huge amount for a global airline- I shouldn't expect VIP treatment. Nonetheless, I had to express what I went through. No hard feelings. That's a big joke ! Spending so much money and then time to get this? Seriously the airlines need to do something. We had accumulated miles, not points on Lufthansa and we utilized it to buy our (two) return tickets to Europe last year. It was valid for only the basic fare and we had to pay for extra. Well, all my tickets were ultra low fares, that qualify for very little miles-so I am fine as I haven't spent lots of money on tickets. I think I have used miles and points interchangeably.. Good to know you had entire trip from accumulated points..
Ok here it goes from my personal standpoint. First, Most cheap fares these days give hardly anything in terms of airmiles. Second, For 20k you could have flown Singapore air from Delhi to Beijing return. It would have cost you an additional 6k from Chennai Delhi return but would have given you a free city tour of Singapore plus the awesome Singapore airline experience (miles extra which you could have credited to vistara airlines unless you want to keep miles with Singapore air) . Third, why don't you credit your srilankan airmiles to etihad miles (that's the best airline among oneworld alliance members to credit srilankan miles). Even a cheap 'o' class fare which earns 50% miles in srilankan also earns 50% miles when credited to etihad. Etihad redemption starts at 5000 (can redeem on jet airways among many) and there are some good redemption sweet spots. Example-Seoul to Prague a 9hour flight on airserbia costs only 12500 etihad miles plus taxes. And you can buy miles if you are falling short of miles. I m talking of etihad only coz of srilankan else etihad is not one of my preffered programs to keep my miles. Thanks. I had seen SQ 20k fare, but I will have to spend extra on MAA-DEL and if one flight is delayed, I would be a no show for next flight if they are on different PNR- too much risk- also total time of travel matters as I have limited leaves. Srilankan timing was very convenient. I have seen Singapore so city tour doesn't excite. Thanks for all other tips, but with too little points the amount of time and effort to be spent wasn't worth, so I didn't bother. Redeeming loyalty points seems like a gargantuan task to me.